Description. Western long-eared myotis are small bats (Table 5) and one of the mid-sized species of Myotis in Washington (van Zyll de Jong 1985, Nagorsen and Brigham 1993). In the two subspecies present in Washington, the fur on the upperparts is yellowish brown in M. e. evotis and darker brown to nearly black in M. e. pacificus. Distinct but poorly defined blackish-brown patches may be evident on the shoulders. Pelage color on the undersides is relatively light. Small hairs along the edge of the tail membrane form an inconspicuous fringe that is less distinct than in fringed myotis. Ears and flight membranes are blackish and contrast with the paler fur. Ears are relatively long, extending 5 mm or more beyond the nose when pressed forward. The tragus is long and slender with a small lobe at its base. The foot is relatively small, less than half the length of the tibia, and the calcar lacks a distinct keel. The western long-eared myotis is one of three physically similar long-eared Myotis species in Washington. Strong similarities between western long-eared myotis, especially M. e. pacificus, and Keen’s myotis make simple field identification impossible where these species overlap in southwestern British Columbia and western Washington (Burles and Nagorsen 2003). Van Zyll de Jong and Nagorsen (1994) determined through multivariate analysis that a variety of skull and body measurements can be used to correctly distinguish the two species nearly 100% of the time. However, a few individuals are morphologically intermediate, including some from western Washington, and cannot be reliably identified using these features. Mitochondrial DNA testing of tissue samples has been used to correctly identify captured individuals (T. Dewey, unpubl. data, in Burles and Nagorsen 2003). Taxonomy. Six subspecies are recognized (Simmons 2005), with two occurring in Washington (Manning 1993). Myotis e. pacificus is present in the western part of the state and M. e. evotis exists in the eastern part. Genetic work suggests that this species is closely related to and perhaps conspecific with Keen’s myotis (T. Dewey, unpubl. data, in Burles and Nagorsen 2003). Distribution. Western long-eared myotis occur in western North America from central British Columbia and southern Saskatchewan to central New Mexico and the Baja peninsula (Manning and Jones 1989; Appendix A). Records occur for most of Washington’s counties, but are missing from the south-central Columbia Basin (WDFW WSDM database). Some records from western Washington may be erroneous because of confusion with Keen’s myotis. Population status. Population size and trends are unknown throughout the species’ range, including Washington (NatureServe 2009). In Washington, it is considered the most common bat in lodgepole pine forests and in some other eastside conifer forests (Johnson and Cassidy 1997, Baker and Lacki 2004), and it may be common in the Blue Mountains based on the findings of Henny et al. (1982) at adjacent areas in Oregon. The species is somewhat common to common in low and mid-elevation forests in the northern Cascades (Christophersen and Kuntz 2003) and at Joint Base Lewis-McChord (Wunder et al. 1992, Falxa 2005, 2008a), but was found more infrequently or not detected in other forested locations (Mt. Baker-Snoqualmie National Forest, Perkins 1988; the Olympic Peninsula, Perkins 1988, Erickson et al. 1998, Jenkins et al. 1999, West et al. 2004; the southwestern Cascades, Thomas 1988; Long Island, Pacific County, Christy 1993). Western long-eared myotis were uncommon at Moses Coulee (Rosier and Rosenberg 2006), but were rare or absent during other shrub-steppe surveys in the Columbia Basin (Christy et al. 1995, Fleckenstein 2000, Gitzen et al. 2002, Lindsey et al. 2012). It is regularly captured at multiple sites in Spokane County (H. Ferguson, pers. comm.). This species appears to be adept at avoiding mist nets and has quiet echolocation, which may result in standard capture and acoustic surveys underestimating its abundance (Falxa 2008a). Habitat. 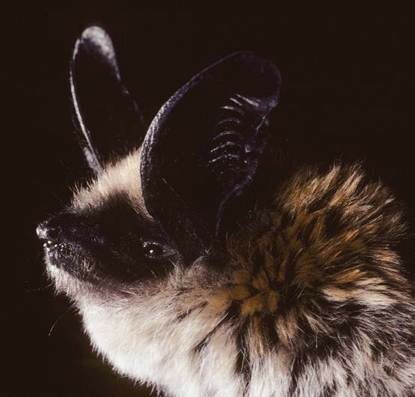 Western long-eared myotis are most commonly associated with conifer forests ranging from drier ponderosa pine to humid coastal and montane forests (Manning and Jones 1989, Johnson and Cassidy 1997, Wilson and Ruff 1999). Non- forested habitats are also used, including shrub- steppe, chaparral, and agricultural lands, if suitable roosting sites, water sources, and riparian habitats are available (e.g., Rosier 2008). Presence of broken rock outcroppings and snags appears to be more important in determining habitat suitability than vegetation type (Wilson and Ruff 1999). The species occurs from sea level to 3,100 m, and is consistently found at higher elevations in Canada (Nagorsen and Brigham 1993). Many of the habitats noted here are occupied in Washington, including subalpine forests up to 1,640 m in elevation (Petterson 2001, Christophersen and Kuntz 2003). Elevation appears to limit the distribution of reproductive females in Washington. Baker and Lacki (2004) found proportionately fewer adult females at higher (1,000-1,400 m) elevations compared to lower (760-1,260 m) elevations along the east slope of the Cascades in Kittitas and Yakima counties. Roosts and roosting behavior. Day roosts are located beneath loose bark on trees, snags, stumps, and downed logs, as well as in buildings, crevices in ground-level rocks and cliffs, tree cavities, caves, and mines (Manning and Jones 1989, Vonhof and Barclay 1996, 1997, Ormsbee and McComb 1998, Rabe et al. 1998a, Waldien et al. 2000, 2003, Chruszcz and Barclay 2002, Rancourt et al. 2005, Solick and Barclay 2007, Arnett and Hayes 2009, Nixon et al. 2009). Maternity colonies typically contain 4-30 females, whereas males and non-reproductive females live singly or in small groups, occasionally occupying the same site as a maternity colony (Manning and Jones 1989, Nagorsen and Brigham 1993, Rancourt et al. 2005). Conifer snags used as maternity roosts are usually large in diameter and height, and in intermediate stages of decay with exfoliating bark present (Table 3; Ormsbee and McComb 1998, Rabe et al. 1998a, Waldien et al. 2000, Arnett and Hayes 2009). Such roosts often occur in canopy gaps or near forest margins, and are located mainly in upslope areas near water. Stumps in clearcuts are also important as day roosts for reproductive and non-reproductive females and males in areas, but are usually occupied only 5-10 years before over- topping vegetation prevents access (Vonhof and Barclay 1997, Waldien et al. 2000). Stumps and downed logs may be mostly used when snags are unavailable (Arnett and Hayes 2009). At Turnbull National Wildlife Refuge in eastern Washington, maternity colonies occur almost entirely in crevices in small rock formations (Rancourt et al. 2005). Maternity colonies have also been noted in an attic in Clallam County (Perkins 1988) and in mines in Ferry and Stevens counties (BLM, unpubl. data). Females and males switch day roosts once every 1-4 days (Vonhof and Barclay 1996, 1997, Waldien et al. 2000, Chruszcz and Barclay 2002, Rancourt et al. 2005, Solick and Barclay 2007, Arnett and Hayes 2009, Nixon et al. 2009). Ground roosts are usually clumped within a relatively small area (Solick and Barclay 2007, Nixon et al. 2009). Reproductive females show considerable flexibility in their use of torpor based on location and reproductive stage. Females in mountainous areas enter torpor less frequently than those in lowland regions (Solick and Barclay 2007). Pregnant animals use deep torpor more often than lactating ones in some locations (Chruszcz and Barclay 2002, Solick and Barclay 2007). Caves, mines, bridges, and outbuildings are used as night roosts (Manning and Jones 1989, Nagorsen and Brigham 1993, Adam and Hayes 2000; H. Ferguson, pers. comm.). In the Columbia River Gorge, caves serve as night roosts, but not as day roosts (Maser 1998). Caves, mines, and possibly buildings serve as hibernacula (Marcot 1984, Nagorsen and Brigham 1993). In northwestern California, hibernacula occur in low- to mid-elevation (800-1200 m) caves with a southerly orientation near permanent streams (Marcot 1984). In Washington, single individuals have been found hibernating in a lava tube in Skamania County (Senger et al. 1974) and a cave in Klickitat County (Perkins et al. 1990). Whether this species hibernates in trees is unknown. Hibernation begins from about late September to late October (Nagorsen and Brigham 1993, Maser 1998). Reproduction. Sperm production in males begins in July or early August in preparation for breeding (Manning and Jones 1989). In eastern Washington, males with descended testes were noted by 12 July (Baker and Lacki 2004). Mating occurs in fall or early winter, presumably after females and young join males at swarming sites outside hibernacula, with ovulation and fertilization delayed until spring (Wilson and Ruff 1999). In eastern Washington, pregnancies have been noted from June until late July (Baker and Lacki 2004). Births have been reported in mid-July in western Washington (Maser et al. 1981) and from late June to early July in south-central British Columbia (Holroyd et al. 1994). Females give birth to one young per year. Lactation occurs from late June or early July to early August in eastern Washington and British Columbia (Holroyd et al. 1994, Baker and Lacki 2004). Young begin to fly about a month after birth (Caire et al. 1979), with flying young first observed on 2 August in eastern Washington (Baker and Lacki 2004). Food habits and foraging. Moths are important food items for western long-eared myotis, but beetles, flies, spiders, true bugs, and other insects are also eaten (Barclay 1991, Wilson and Ruff 1999, Lacki et al. 2007b). Diet has been well studied in Oregon and is similar on both sides of the state (Whitaker et al. 1977, 1981a, Henny et al. 1982, Ober and Hayes 2008a), as well as in north-central Idaho, with moths dominating the diet in all three regions (Lacki et al. 2007b). Moths, caddisflies, and termites were the main foods in a small sample from Joint Base Lewis-McChord, Washington (Wunder et al. 1992). This species displays flexible feeding behavior, catching prey either by aerial hawking or gleaning from vegetation or the ground while hovering (Manning and Jones 1989). These bats are considered slow fliers with good maneuverability (van Zyll de Jong 1985). Western long-eared myotis emerge from day roosts near dusk to forage and return about 2 hr before sunrise (Nagorsen and Brigham 1993, Waldien and Hayes 2001). Bats forage for about half of the night, averaging four activity periods that are interspersed with short periods of inactivity. Foraging occurs in a variety of forest types, along forest edges, and over open meadows, but riparian areas and other habitats near water appear to be especially preferred (Manning and Jones 1989, Barclay 1991, Waldien and Hayes 2001, Rosier 2008). On the west slope of the Cascades in Oregon, activity areas of adult females averaged 38 ha and were centered an average of 518 m from day roosts (Waldien and Hayes 2001). Seasonal movements. This bat probably migrates short distances between summer roosts and winter hibernacula (Manning and Jones 1989). Nothing is known about seasonal movements in Washington. Threats. Activities causing the destruction of roosts in large trees, cliffs, caves, and abandoned mines are considered the major threat to this spe- cies (Wilson and Ruff 1999, WBWG 2005, Nature- Serve 2009). Because of the extensive loss of large snags and decadent trees in low elevation forests resulting from timber harvest, winter roost sites may be a limiting resource for this species. Loss or degradation of riparian zones likely has negative impacts, especially in drier regions. Disturbance of maternity roosts and hibernacula represents another threat. Pesticide applications in occupied regions may also be harmful. White-nose syndrome may pose a substantial risk for this species because of its similar roosting behavior and sometimes close as- sociation with little brown myotis, which has been severely affected by the disease in eastern North America. Conservation measures. Maintaining and recruiting large numbers of large-diameter (>60 cm dbh), tall conifer snags in the early to middle stages of decay should provide suitable day- roosting structures for this species when located near water, foraging habitat, and night roosts. At the stand-scale, large snags are more likely to be used if they occur in clusters of other snags and if they are easily accessible to bats or have greater sun exposure (Waldien et al. 2000, Arnett and Hayes 2009). Maintaining high densities of suitable snags at a variety of elevations will help meet seasonal thermoregulatory requirements. In westside forests, snags in upland sites are preferred to those in riparian areas (Arnett and Hayes 2009). Thinning dense forests may increase bat activity and accelerate development of large trees and, depending on management, snags for use as roosts. Green tree retention of large trees, such as Douglas- fir in westside forests and ponderosa pine, grand fir, and Douglas-fir in eastside forests, can provide future snags as day roosts. Conservation of riparian zones is likely important to maintaining populations in drier locations. Caves and mines may provide hibernacula; if entry by people is a conservation or safety issue, these structures should be signed and/or gated based on established gating procedures. Silvicultural prescriptions should be evaluated and modified, if necessary, to ensure that suitable conditions are maintained for the main prey (i.e., moths, beetles, and flies) of this species. This includes evaluation of pesticide spraying programs to control forest insect pests, which may adversely affect non-target moths.